To answer some of the most common questions people ask us, we have put together the following guide for how to buy a wedding ring. The most popular metals used for wedding rings are White Gold, Yellow Gold, Rose Gold and Platinum. These metals are all very durable and hence suitable for items of jewellery that will be worn for many years. The choice of metal is one of personal taste. For anyone with an engagement ring, we highly recommend matching the metal type to minimise wear and tear. Those who regularly wear a watch will most often choose a metal to match and complement it. Whilst White Gold and Platinum are two completely different metals, the appearance is virtually indistinguishable once White Gold is rhodium plated (a process we do to all of our white gold rings unless requested otherwise). Click here for a description of the pros and cons of Platinum vs White Gold. You are also very welcome to come in for an obligation-free appointment where one of our expert jewellers can answer your questions and show you our range of metals to try on and choose from. Which profile do I like best? The ‘profile’ of a wedding ring refers to the ‘shape’ of the band’s circumference. For example, a ‘flat profile’ wedding band has no rounded edges, only four flat sides, whereas a ‘rounded’ band is round on all sides. There are many other profiles to choose from, such as high dome, low dome, knife edge and parrot nose. During your appointment, one of our friendly jewellers will show you examples of each, which you can try on to assist with your decision. 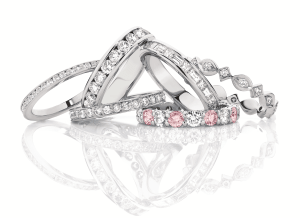 For the ladies, we recommended matching the profile of your engagement ring. Which width is best for me? Choosing the width of your band is also a matter of personal preference. Each of Larsen Jewellery’s wedding rings are custom made to meet a minimum standard thickness and width, to ensure durability and overall quality. For those wearing an engagement ring, it’s most common to match the width of the engagement ring as they will usually be worn together. For others, it is simply a matter of comfort and style, as well as what proportion will suit your finger. Which metal finish would I like? Once you have chosen your metal type, you will then get to choose which finish you would like for your ring. The two main options are polished (shiny) or matte (brushed). Many men choose to have a combination of polished and matte. You can see examples of this in our design gallery. Almost all women choose a polished finish to complement their diamonds. Would you like to add diamonds, engraving or any other detailing? As we specialise in custom made rings, our customers have many additional design options to choose from. Diamonds and engraving (both on the inside or outside) are the most popular choices, but there are also details such as mill grain (fine ‘dots’ of metal bordering selected edges of your design), Mokume Gane (a Japanese technique using a mixture of metals, which are worked together to create a unique pattern), cut grooves and more. Many women choose to have the diamonds in their wedding ring line up and match with the diamonds in their engagement ring for an overall uniform look. Does it need to fit to, or match with an engagement ring? The Larsen Jewellery team is highly skilled in the art of perfectly matching and fitting your wedding ring to your engagement ring, no matter how complex the design. If your engagement ring was not made for a wedding ring to sit flush beside it, we will custom make your band to ‘fit’ against your engagement ring setting smoothly, without making any changes to your engagement ring. The benefit of this is not only visual, but also structural. If you have a protruding engagement ring setting, a straight wedding band will rub against the setting and cause it to wear away more quickly over time. Incorporating a notch or curve into your wedding band means the rings will not rub away at each other, but rather ‘lock in’ to each other. During your appointment, your jeweller will advise you whether a fitting is necessary for your ring design.